Nitrogen can be deficient in underfertilized peach and nectarine orchards [N16]. Symptoms of N deficiency include pale green leaves near the terminal of the shoot and yellow leaves at the base, while the leaf midribs and stems are red. Later in the season, red and brown spots develop in the leavesof very deficient trees. Premature leaf drop is common. Shoots of N deficient trees are shorter and leaves are smaller, although not as small as are seen in zinc deficiencies. Fruits are often smaller and are more highly colored. Under severe deficiencies fruit can become astringent and fibrous [N17, N23]. In orchards with ring nematode infestations, bacterial canker symptoms are worse in N-deficient trees [N5]. Photos of N deficiency symptoms on peach and nectarine can be found here. Excessive N stimulates too much vegetative growth, which increases summer pruning, may shade out and kill the lower fruiting wood, delays maturity, lengthens the harvest period and causes poor coloration [N6, N16, N23]. Overfertilized trees are more susceptible some pests [N6] and to to brown rot infection, which is particularly a problem on nectarines [N1, N6]. Too much N fertility should especially be avoided for early fresh market varieties where an early harvest date and color are important. Soil nitrate analyses are less common in orchards than in annual crops. However, soil nitrate analyses can provide information for the fine-tuning of the fertilization program. Although most of the N utilized for early spring growth comes from N reserves stored in the tree, soil nitrate-N present in spring contributes to the tree's N nutrition. One ppm of NO3-N per foot of soil corresponds to 3.5- 4 lbs N/acre. For example, a NO3-N concentration of 5 ppm in the top foot of the profile corresponds to 17.5- 20 lbs N/acre. 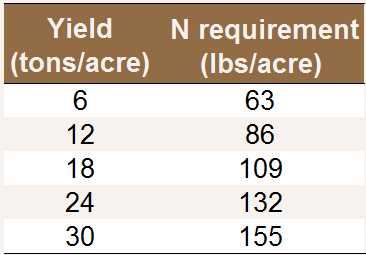 The N application rate should be adjusted for high residual nitrate concentrations. For more information, see Soil Sampling in Orchards. In orchards, leaf analyses are more reliable for the diagnosis of nutrient deficiencies and excesses than soil analyses. Leaf analyses are a vital component in evaluating a allow growers to evaluate their fertilization program. Leaf N should be monitored yearly [N16]. University of California critical nutrient values have been established for June and July sampling, at which point nutrient contents are relatively stable [N16]. Trees that have received foliar N should not be sampled for at least one week after the application. 60 to 100 mid-shoot leaves are taken from moderately vigorous (10-20 cm long) current-season shoots. One or two leaves should be taken from random trees throughout the orchard area. Unhealthy, stunted or injured trees are avoided and non- representative areas are sampled separately. Samples are submitted to a lab as soon as possible. They should be refrigerated until they can be sent if a delay is anticipated. It's good practice to bring a notepad along to record tree vigor in the different blocks. The information together with the laboratory analyses and yield data can help with future fertility planning [N31]. Critical N nutrient levels in peach and nectarine July leaf samples [N3, N7, N16]. Negative effects of too much N are usually more serious than those of a slight N deficiency, especially for fresh market fruit. Therefore when high color and early harvest date are valued it's safer to stay in the low to middle region of the adequacy range [N7, N16, N19]. For fresh market peaches and nectarines, Day and coworkers [N8] suggest a range of 2.6% to 2.8% for optimum color and storage quality. For cling peaches, Johnson [N16] suggests aiming for values between 2.8% and 3.0%. Cling peaches have slightly higher critical values than freestone peaches and nectarines [N3], possibly because they tend to be higher-yielding [N42]. A higher leaf N range may be desirable in some heavy-producing late varieties [N16]. Young bearing trees (3 years or less) also may have a higher optimum range than older trees [N37]. If leaf N is >3.0% and the trees are overly vigorous (>1-2 feet of new shoot growth) applications may be stopped for a year or two until leaf N falls in the desired range [N14, N23]. Analysis of dormant tissues may provide more accurate information for spring fertilizer adjustments than July leaf samples, and allows the grower to make decisions in time to affect the current year's yield. A sample of 30 to 40 moderately vigorous shoots, 10 to 20 inches long, is collected from the lower part of the canopy in January. Some early results suggest that shoot samples taken in September would give similar results. Samples are dried and sent to a lab for analysis [N18]. A trial carried out at the Kearney Agriculture Center with 'Zee Lady' peach and 'Grand Pearl' nectarine grown in sand tanks suggests a tentative deficiency threshold of 1.2% N [N8]. Further research is needed to determine whether this threshold is affected by tree age, variety or environmental conditions [N8]. For more information, see the University of California Fruit Report. Nitrogen fertilizers need to be applied with care to young trees, as high N concentrations in soil solution may burn the roots. A good rule is to apply no more than one ounce of N per tree per year of growth with a single application [N15]. At a spacing of 15' x 18' (151 trees/acre), this would come to 9.4 lbs N/acre per application. To avoid fertilizer burn, this rate should be reduced for stunted trees and in hot weather, when trees take up a lot of water [N9]. Reil and Duncan [N36] suggest a total annual rate of 4 oz N/tree in the first year of growth and 8 oz/tree in the second, divided into three or four small applications throughout the season. In the third year, the application can be increased to 12 oz N/tree. This rate should be adjusted for the N supplied by soil and irrigation water. In some cases, these are sufficient for the first season's growth and no additional N need be added [N26]. Granular fertilizers should be placed at least 18 inches from the trunk, but within the wetting zone of the irrigation system, and should be watered in with at least 2 inches of irrigation water if sprinklers are used [N36]. When N is fertigated, the fertilizer should be injected into the irrigation system in the middle third of the irrigation set [N30]. For example, in an 18-hour irrigation set, fertilizer is injected from hour 6 through hour 12. This prevents urea and nitrate from moving below the root zone but still ensures that the N is distributed well in the wetting zone. Fall foliar sprays are often done in addition to soil treatments on young trees (See Foliar N). Liquid fertilizers more easily burn young roots and may be dangerous to use with first-leaf trees [N15]. A conservative approach is to use a granular fertilizer blends such as 12- 12-12 and 15-15-15, which also supply P and K.
Newly planted trees normally do not need to be fertilized until after growth has begun in spring or early summer [N26]. Frequent, small applications are preferred to large applications [N9]. On infertile soils or on trees grafted on dwarf rootstocks, a small application at budbreak may be beneficial [N40]. Bacterial canker is a problem in young stone fruit trees replanted on old orchard sites that are infested with ring nematodes. Nematodes damage the young root systems' ability to take up N from the soil and the N-deficient trees are more susceptible to canker [N5]. These orchards may therefore benefit from higher N rates and foliar fertilization. An experiment on a 2-year old replanted 'Loadel' commercial peach orchard near Modesto found that supplementing the grower's normal fertilization (fertigation with 110 lbs N/acre) with about 50 lbs N/acre as fertigated N and 50 lbs N/acre as a fall foliar spray of low-biuret urea reduced canker severity in infested (unfumigated) areas to the level observed in uninfested (fumigated) areas [N5]. See Foliar N for more details. A combination of soil-applied and foliar fertilizers is often used. Crop load drives the demand for nitrogen fertilization. The higher the current crop load, the more nitrogen is needed to replace what will be removed by the developing fruit. Between 2 and 3 lbs N is removed with each ton of peaches harvested [N12, N33, N39]. Nectarines may remove more per ton of harvest than peaches [N19, N25, N28]. Niederholzer and coworkers [N33] found that the perennial structures of 4-year old 'O'Henry' peaches in Yolo County at a tree density of 427 trees/acre acquired an additional 19 lbs N/acre over the course of a year. Abscised leaves and prunings were found to contain an additional 59 lbs N/acre; however, if left in the orchard 80-90% of this may be assumed to be cycled back into the soil, becoming available again for plant uptake over the course of a few years [N41]. For more information see Nitrogen Uptake and Partitioning. Approximate fertilizer requirements for mature peach and nectarine orchards [N33, N41]. Assumes that prunings are not removed from the orchard, 2.69 lbs N are removed per ton yield and N use efficiency is 70%. Non-fertilizer N sources, including N supplied by the soil, irrigation water nitrate and organic inputs or cover crops may be significant and should be taken into account. If fall urea sprays are used for bacterial canker control, this N should also be included in the total rate [N11] (See Foliar N). Annual rates should be adjusted based on annual leaf analyses (See Tissue analysis). The values in the table are in line with N recommendations in California: An annual rate of 25 to 75 lbs N/acre is usually enough to maintain adequate N fertility in fresh market peaches and nectarines, depending on the efficiency of the fertilization method [N8]. Rates of 50-100 lbs N/acre are more common on processing peaches [N34] , which are generally higher-yielding [N28]. Higher rates will be required for N-deficient orchards [N23]. Early varieties usually allocate more N to shoot growth than later varieties [N35]. Lower N rates on these varieties are advisable, to avoid excessive vegetative growth and delayed maturity [N6, N35, N39]. When well water is used for irrigation, it may contribute a significant amount of N. Well water samples should be taken after the pump has been run for several hours, to make sure that the water sampled is representative of what the orchard will receive [N32]. Nitrate in well water can be calculated as the ppm of nitrate-N x 2.72 = lbs N applied in one acre foot of water. For example, a test value of 7 ppm nitrate-N in an orchard receiving 2 acre-feet of water per year would mean that 38 lbs N/acre are added annually with the irrigation water. If the concentration of nitrate rather than nitrate-N is given, multiply by 0.614 rather than 2.72. To estimate N credits, only the nitrate-N in the water taken up by the trees, which corresponds to the evapotranspiration (ET) rate, should be counted [N32]. Application through low-volume irrigation systems or banding is more efficient than broadcasting [N29, N32]. When applied through fertigation, the fertilizer should be injected into the irrigation system in the middle third of the irrigation set. For example, in an 18-hour irrigation set, fertilizer is injected from hour 6 through hour 12. This prevents urea and nitrate from moving below the root zone but still ensures that the N is distributed well in the wetting zone and not overly concentrated, causing root burn [N32]. Granular applications should be applied in the tree row, along the herbicide strip, and surface-applied N should be incorporated either mechanically or flushed in with irrigation water. This is especially important when fertilizers containing ammonium or urea are used in hot, windy weather and on soils with an alkaline pH because these factors increase ammonia volatilization. A number of mineral N fertilizers are available to growers. Mineral fertilizers contain N in the form of urea, ammonium, nitrate or a mix of these. When losses are minimized and equal amounts of N are added, these fertilizers give similar yields and quality [N23]. The N forms, however, behave differently in the environment. Nitrate is very mobile in the soil and can easily be leached into deeper soil layers with irrigation water or rain. Ammonium is less mobile, but is generally converted quickly to nitrate by soil microorganisms, especially in warm and moist soils, unless they are water saturated. This process, nitrification, can lower soil pH. The acidifying effect is especially strong when ammonium fertilizers are applied by drip systems as they are concentrated in a small soil volume [N43]. Ammonium may volatilize as ammonia, especially when applied to the surface of dry and alkaline soils without incorporation. Urea is relatively mobile in the soil, but is generally quickly converted to ammonium. The risk of ammonia volatilization is very high when urea is left on the soil surface. More detailed information about the most common fertilizers can be found on the IPNI website. Peaches and nectarines take up very little N during dormancy and in spring before leaf-out [N27, N38]. Unless trees are very N-deficient fertilizer N will not be taken up until active growth resumes and may be lost [N24, N33]. Soil N applications are therefore most efficient in mid-spring at the beginning of vegetative growth and after harvest, as long as the leaves are still green and temperatures are warm enough for N uptake [N27, N35]. Because much of the N used for new growth is recycled from the woody parts of the tree, the timing of N application does not normally affect tree performance as long as it is during a period of active uptake [N33, N35]. No clear differences in N uptake efficiency or yield have been demonstrated between summer, fall or split applications [N24, N33, N39]. However, split applications are generally considered more efficient than single applications, especially on sandy soils [N8, N33, N40]. If fertilizer is broadcast, splitting applications will increase the efficiency [N17]. In sandy soils or for late maturing varieties, soil-applied postharvest N is at risk of leaching and polluting the groundwater. Under these conditions, foliar urea application may be a more efficient method for supplying postharvest N (see Foliar N). Nitrogen may be fertigated as long as the trees are actively taking up N. A FREP-funded experiment in Fresno County found no difference in peach growth, yields or groundwater nitrate leaching between a treatment consisting of one May and one September fertigation and a second treatment in which the same amount of N was split between three May and three September fertigations [N20]. However, large temporary increases in groundwater nitrate occurred following the single fall application. This suggests that with heavy doses, sandy soils or in wet weather split fall applications or a foliar application may be more efficient than a single large fall application (See Foliar N ). Varieties harvested in May or June can become overly vigorous after harvest, and overapplication of N early in the season should be avoided for these varieties [N21, N35]. Applications in late summer or early fall may be better than heavy spring applications, as they provide enough N to support next year's crop but stimulate post-harvest summer growth less [N22]. A FREP-funded study on 'Early Maycrest' peaches in Yolo County found that trees fertilized with 50 lbs N/acre of soil-applied ammonium nitrate in September combined with 50 lbs N/acre of foliar urea in October maintained similar yields but had lower postharvest leaf N and needed less summer pruning than trees receiving the soil application in April, or trees receiving no foliar N and a soil application of 100 lbs N/acre split between April and September [N21]. While peaches and nectarines need some soil N to support good root function, about 20-50% of their N nutrition may be supplied through the leaves [N8, N22]. Foliar sprays are an efficient way to supply postharvest N to late- maturing varieties and in sandy soils. They are especially useful under conditions which limit root N uptake, such as nematode infestations, high water tables and cold weather [N10, N11].Foliar applications may reduce summer pruning weights in early varieties compared with soil applications [N21]. However, there is no evidence that foliar fertilization gives higher yields than soil applications in a healthy orchard [N21]. If application is done in fall, about 50 lbs N/acre may be applied in a single spray [N21]. If multiple applications are needed, they should be spaced at least two weeks apart [N11]. Solutions of 10% low biuret urea may be used. Lower concentrations should be used if sprays are done in spring to avoid foliar damage. In orchards affected by bacterial canker, a spray of 100 lbs urea/acre (46 lbs N) in addition to normal fertilization has been demonstrated to reduce symptoms [N10]. All foliar-applied N should be included as part of the tree's annual N requirement. July leaf analysis can be used to adjust rates. Urea is the cheapest type of foliar N, and the most easily absorbed by the leaf [N13]. Low-biuret urea is suggested, as biuret levels contained in normal soil urea vary widely and a high biuret dose can damage small shoots (Roger Duncan, personal communication). If foliar N is being used to reduce the severity of bacterial canker symptoms, urea and ammonium forms may be more effective than nitrate [N4]. The most efficient time to spray foliar urea is in fall before natural leaf senescence. When sprays are done in fall rather than in spring or summer, higher concentrations may be used because foliar damage is not a concern, and the application may be combined with a fall zinc spray [N2, N22]. However, when applications are done too close to leaf senescence (November) less of the sprayed N will be exported from the leaf to woody tissue before leaf fall, resulting in less N being available to support spring growth [N22]. A study on 'Summer Beaut' nectarines and 'David Sun' peaches in Fresno county found that when a fall urea spray was combined with Zn, more of the applied urea N was remobilized from the leaves to the permanent structures than when urea was sprayed alone [N2]. Phosphorus deficiency is very rare in California peach and nectarine orchards, even on P-deficient soils [P3, P18]. Leaves of deficient trees are dark green, later turning bronze and developing a leathery texture. Purple or red coloration may be seen on leaves, petioles and young shoots. Leaves may be smaller and premature defoliation may occur. Fruit are highly colored and ripen earlier, but are not good quality and are susceptible to postharvest browning, especially in nectarine [P13, P15]. Photos of P deficiencies in peach and nectarine can be found here. Excessive P may exacerbate Zn deficiencies [P9]. Soil samples taken before an orchard is planted provide valuable information about soil conditions, salinity and nutrient availability. Soil analyses for nutrient availability are less common in existing orchards, as decisions are generally based on leaf analyses. [P9]. However, soil analyses may be useful to monitor trends in nutrient availability over the years. Soil samples for nutrient analysis should be taken from the main root zone. Peach roots extend to about 5-6 feet [P14], but active roots are concentrated in the top two feet of soil [P7]. When the soil samples are also used to assess soil salinity, sampling to a depth of 4 feet may be required [P24]. For more information on sampling procedure see Soil Sampling in Orchards. The University of California has not developed critical values for soil analysis in peach or nectarine orchards. The table below gives some general guidelines for soil test interpretation in orchards. Interpretation of P and K soil test results in orchards [P6]. Young trees may respond to P fertilizer at higher soil P concentrations than mature trees [P21]. Soil test results should be interpreted along with leaf analyses and visual observations of deficiency, as mature stone fruit trees may maintain sufficient P for good growth and high yields even on very deficient soils [P19]. University of California critical nutrient values have been established for June and July sampling, at which point nutrient contents are relatively stable [P8]. It's good practice to bring a notepad along to record tree vigor in the different blocks. The information together with the laboratory analyses and yield data can help with future fertility planning [P23]. Nutrient deficiency thresholds in peach and nectarine [P1]. A FREP-funded experiment was initiated in 1999 with the goal of improving traditional peach and nectarine deficiency threshold values. 'Zee Lady' peaches and 'Grand Pearl' nectarines were planted in large outdoor sand tanks and subjected to different deficiencies. Results suggest that a P deficiency threshold of 0.12% is more appropriate than the usual published value of 0.10% [P12, P11]. If leaf values fall in the adequate range, P fertility may be maintained by replacing what was lost in the harvest (see Rate); if trees are deficient higher rates may be required. Problems associated with excessive P may be encountered when the leaf concentration is >0.4% [P9]. Leaf P analyses should be combined with visual observation of symptoms, as there is a tendency for vigorous and high-yielding trees to have relatively low leaf P [P19]. A sample of 30 to 40 moderately vigorous shoots, 10 to 20 inches long, is collected from the lower part of the canopy in January. Some early results suggest that shoot samples taken in September would give similar results. Samples are dried and sent to a lab for analysis [P10]. A trial carried out at the Kearney Agriculture Center with 'Zee Lady' peach and 'Grand Pearl' nectarine grown in sand tanks suggests a deficiency threshold of 1.1% P [P3]. Further research is needed to determine whether this threshold is affected by tree age, variety or environmental conditions [P3]. If an orchard is planted on soils known to be P- deficient, triple-superphosphate added to the planting hole may aid establishment. Lilleland and Brown [P17] found that when 10 lbs of triple-superphosphate were mixed with soil at the bottom of the planting hole of 'Elberta' peaches on a very P-deficient soil in Paradise, California, vegetative growth was improved for three years compared with untreated trees [P17]. A similar result was seen with low-chill peaches in Australia, even on non-P deficient soils [P26]. Little research has been done on the P requirements of young peach or nectarine trees on non-deficient soils. Under proper pH conditions, P reserves in most California soils will be sufficient to support peach growth. Small applications of 15-15-15 or 12-12-12 are often broadcast on young orchards. However, this practice is probably more useful as a safe way to apply N to young trees than as a source of K or P (Roger Duncan, personal communication). Phosphorus deficiency has rarely been observed in stone fruit orchards in California [P15]. There are currently no University of California recommendations for P fertilization of peach or nectarine orchards. Soil and leaf analyses can be used to monitor the P status of an orchard over the years to ensure that the P availability is adequate (See Soil P Test and Leaf P Analysis). To maintain soil P availability in the long term, the amount of P removed with harvested fruits needs to be replaced. Approximately 0.5-1.0 lbs P2O5 (0.22-0.44 lbs P) is removed per ton of fruit [P5, P16, P20, P25]. For example, a harvest of 15 tons/acre of peaches would remove 7.5 to 15 lbs of P2O5/acre. If summer prunings and abscised leaves are removed, around 3-5 lbs/acre P2O5 are lost from a medium density orchard [P5, P28]. These amounts are in line with Johnson and Uriu's [P15] recommendation that most fruit trees require around 11-22 lbs P2O5/acre. Over the years, the fertilization program can be evaluated based on leaf analyses. Phosphorus may be fertigated [P22]; however care must be taken to prevent the formation of calcium phosphates which can plug the emitters [P2]. If P is fertigated, lower rates can likely be used [P22]. Facts sheets about the most common fertilizers can be found on the IPNI website. Phosphorus is immobile in the soil and is barely leached. The time of application is therefore not crucial as it is for N. It may be applied with K in November after leaf drop. Phosphorus does not normally need to be applied every year on fruit trees. Foliar P applications to peaches and nectarines may increase P status of trees on deficient soils [P27]. However, research on young peaches in sand culture suggests that applying P fertilizer to the soil is more effective, and that foliar fertilization alone cannot supply the tree's P requirement [P27]. Potassium deficiency is uncommon in California orchards but has been observed, especially in sites where the topsoil has been removed by levelling [K4, K14]. K deficiency symptoms are first seen in early summer and become most pronounced midsummer [K16]. Midshoot leaves are pale and a characteristic edge curling or rolling may occur, especially on peach. Margins grow chlorotic and then die. This leaf scorching may grow inwards, leaving cracks, tears and necrotic spots in the leaves. Defoliation of older leaves occasionally occurs. Fruit set, shoot growth and leaf size are reduced. Fruit color is poor on K deficient trees and fruit size is reduced. Fruit size may be limited by insufficient K even if other signs of deficiency are lacking, so tissue analysis is important [K4, K16] (See Tissue Analysis). Photos of K deficiency in peach and nectarine can be found here. Soil samples taken before an orchard is planted provide valuable information about soil conditions, salinity and nutrient availability. Soil analyses for nutrient availability are less common in existing orchards, as decisions are generally based on leaf analyses. Soil samples for nutrient analysis should be taken from the main root zone. Peach roots extend to about 5-6 feet [K13], but active roots are concentrated in the top two feet of soil [K10]. When the soil samples are also used to assess soil salinity, sampling to a depth of 4 feet may be required [K20]. For more information on sampling procedure see Soil Sampling in Orchards. Interpretation of P and K soil test results in orchards [K8]. Trees that have received foliar K should not be sampled for at least one week after the application. Samples are submitted to a lab as soon as possible. If a delay is anticipated, they may be refrigerated until they can be sent. It's good practice to bring a notepad along to record tree vigor in the different blocks. The information together with the laboratory analyses and yield data can help with future fertility planning [K19]. If leave values fall in the adequate range, K fertility may be maintained by replacing what was removed with the harvest (see Rate); if trees are deficient higher rates may be required. If leaf K falls between 1.0 and 1.2%, deficiency symptoms may not be obvious but fruit size may be reduced in some years, and test applications are recommended [K1]. Nutrient deficiency thresholds in peach and nectarine [K1]. Results from leaf analyses refer to the average of all trees sampled in the orchard with some trees being below and others above the average.Based on experience with almonds, the University of California Fruit Report advises that to minimize the risk of some trees in the orchard being deficient and possibly bearing smaller fruit, leaf average K concentration should be maintained above 1.5% [K4]. Little research has been done on the K needs of young peach or nectarine trees. Small applications of 15-15-15 or 12-12-12 are often broadcast on young orchards. However, this practice is probably more useful as a safe way to apply N to young trees than as a source of K or P (Roger Duncan, personal communication). Young trees may also be fertigated with K.
Potassium chloride fertilizer should not be used on young stone fruit trees, as they are sensitive to chloride [K3]. To maintain soil K availability in the long term, the amount of K removed with harvested fruits needs to be replaced. This amount varies greatly with soil type, variety and environment. A comparison of values obtained from orchards around the world suggests that on average, 4 to 5 lbs of K2O (3.3-4.2 lbs K) are removed per ton of fruit harvested [K7, K15, K17, K22]. For example, a harvest of 15 tons of peaches per acre would remove 60-75 lbs K2O. In deficient orchards, Johnson and Uriu [K14] recommend shanking in 5 to 10 lbs K2SO4/tree (377-755 lbs K2O/acre at a density of 151 trees/acre). This would correct deficiencies for several years. This rate can be halved if fertigation is used [K14]. Soil properties can affect K availability. Higher rates may be required for heavy soils, in which more K is held on clay mineral surfaces, compared with lighter soils [K14]. In areas where soils are known to fix K, such as the east side of the San Joaquin Valley, analyzing the soil for its K fixation capacity before the orchard is planted helps adjust the K fertilization program. A discussion about K fixation in the San Joaquin Valley can be found here. For more information about soil K fertilization in your area, contact your local farm advisor. Potassium can be applied as granular, dry fertilizer or dissolved in solution through the irrigation system. Surface applied K may be held in the top few inches of clay-rich soils, making it less available to the roots. This effect makes broadcast or sprinkler applications less effective than band applications or fertigation [K3]. Drip-applied K is more mobile in the soil and can penetrate deeper in to the root zone [K18]. Granular K fertilizer can be drilled 6 to 8 inches deep in one or two bands on opposite sides of the tree row, in the herbicide strip [K1]. Bands should be made in the same place every year, and should be within the wetting zone of the irrigation system [K3]. On heavy soils, gypsum (CaSO4 ) is sometimes added in the same band or in the same location as previous bands at rates of 1000-4000 lbs/acre. The calcium ion competes with K for binding sites on soil surfaces, helping it move deeper into the root zone [K3]. Many types of K fertilizer may be used and are equally effective [K23]. Potassium sulfate (K 2SO4) and potassium thiosulfate (KTS) are common. KTS is efficiently applied through microirrigation systems, but is more expensive than K2SO4. Potassium nitrate (KNO3) and potassium chloride (KCl) are also used [K14]. If using KNO3, the nitrate needs to be considered as part of the N application rate. Because peaches and nectarines are sensitive to chloride, KCl must be used with care and is not recommended in the San Joaquin Valley or on soils with that have poor drainage, high water tables, limiting layers or high salinity [K6, K14]. Although KCl fertigation is possible this practice is risky, as chloride may burn the roots. Excess chloride contributes to salt toxicity. On stone fruit this appears as marginal leaf burn beginning at the leaf tip and moving along the edges, followed by defoliation, shoot dieback and loss of productivity [K2, K11]. Where KCl is used, it is a good idea to test July leaf samples for Cl- and to monitor the status over time. A value of 0.3% Cl- is considered excessive [K1]. Dry K fertilizer is usually applied in late fall [K3]. If KCl fertilizer is used, it should be applied after leaf drop so that the Cl- ion is not taken up by the tree and can be flushed out of the root zone over winter [K3]. Potassium may be fertigated during the growing season. Split fertigations do not seem to be more effective than applying the whole rate at once [K14] though very sandy soils may benefit from dividing the annual K rate between spring and postharvest fertigations [K27]. Foliar K is most likely to improve yields where root function is impaired or where the method of soil application is not efficient. For this reason, response to foliar K is less likely in drip-irrigated orchards [K26]. However, some research suggests that foliar sprays can increase fruit weight and total soluble solids even on well- fertilized orchards [K9, K24]. A study on 6 year old 'Fantasia' nectarine orchards in Israel found that when fungicides were combined with foliar K (monopotassium phosphate) their effectiveness was increased against powdery mildew on fruits and leaves [K21]. Optimal rates and timing for foliar K applications to peaches and nectarines have not been studied widely. A two-year study on a mature commercial 'Royal Glory' peach orchard in Tunisia found that when 40 lbs K2O /acre as K2SO4 were applied as three foliar sprays-- during pit hardening (Stage II), about six weeks before harvest (beginning of Stage III) and three weeks before harvest-- yields matched those of trees receiving the recommended rate of 80 lbs K2O/acre as fertigated K2SO4 through the growing season. Applying 80 lbs K2O/acre foliarly did not increase yields compared to the other treatments, but fruit weight and total soluble solids were significantly higher [K9]. Foliar K applications during the period of rapid fruit growth leading up to harvest (Stage III) may be particularly effective, as during this period fruit K demand is high and may exceed root uptake [K9]. After nitrogen, Zn is the nutrient most likely to be deficient in California peach and nectarine orchards [Zn17]. Symptoms are most commonly seen in early spring and may disappear later in the season; however, yield potential may already be reduced [Zn5]. The most characteristic symptom is "little leaf" disorder, in which small, pointed leaves occur in rosettes at the tips of shoots and young spurs. Foliation may be delayed. Affected leaves become chlorotic, showing interveinal mottling. Often the leaf margins are crinkled or wavy. Defoliation eventually occurs, beginning with the basal leaves. Fruit bud formation may be inhibited, and fruits produced are smaller, can be misshapen and are more prone to cracking [Zn15]. Zinc deficiencies are associated with sandy soils and old corral sites and young, vigorously growing trees[Zn6, Zn15] Zn deficiency is especially common in the San Joaquin Valley [Zn7]. Often Zn deficiencies are caused by rootstocks which do not take up Zn well, such as 'Nemaguard', rather than soil Zn deficiency. [Zn7]. Photos of Zn deficiencies in peach and nectarine can be found here. In orchards, leaf analyses are more reliable for the diagnosis of nutrient deficiencies than soil analyses, and allow growers to evaluate their fertilization program. Leaf Zn should be analyzed every year. Because foliar zinc fertilizers cannot be removed from a leaf surface, leaf analyses are not helpful if foliar zinc has been applied in the orchard earlier in the season. University of California critical nutrient values have been established for June and July sampling, at which point nutrient concentrations are relatively stable [Zn8]. Unhealthy, stunted or injured trees are avoided and non-representative areas are sampled separately. Leaves that have previously been sprayed with Zn should not be sampled. After sampling, leaves are washed in water with a small amount of detergent, followed by one rinse with tap water and two rinses with distilled water (This is only necessary when micronutrients are being measured). It's good practice to bring a notepad along to record tree vigor in the different blocks. The information together with the laboratory analyses and yield data can help with future fertility planning [Zn16]. If observations and leaf Zn concentrations indicate deficiency, Zn should be applied [Zn8]. Nutrient deficiency thresholds in peach and nectarine [Zn2, Zn12]. Results from a study with 'Zee Lady' peaches and 'Grand Pearl' nectarines suggest that a Zn deficiency threshold of 10 ppm may be more appropriate than the usual published value of 15 ppm [Zn13, Zn12]. Leaf Zn levels may be lower in vigorously growing orchards, and leaf Zn may also be affected by past foliar fertilizer history. A good practice is to keep records from past years and track Zn levels over the years. A sample of 30 to 40 moderately vigorous shoots, 10 to 20 inches long, is collected from the lower part of the canopy in January. Some early results suggest that shoot samples taken in September would give similar results. Samples are dried and sent to a lab for analysis [Zn11]. A trial carried out at the Kearney Agriculture Center with 'Zee Lady' peach and 'Grand Pearl' nectarine grown in sand tanks suggests a deficiency threshold of 15 ppm Zn [Zn7]. Further research is needed to determine whether this threshold is affected by tree age, variety or environmental conditions [Zn7]. Mixing 0.25-0.5 lbs zinc oxide with soil from the planting hole can increase leaf Zn concentrations for at least two years and does not harm the young trees, since the zinc oxide is insoluble and acts as a slow-release fertilizer [Zn10]. Pelletized formulations of zinc oxide and sulfur may be even more effective [Zn10]. However, while increasing leaf Zn concentration the technique does not improve growth in young trees that are not Zn-deficient. Zinc sulfate, which is much more soluble than zinc oxide, is very dangerous to use with young trees and should never be placed in the planting hole [Zn10]. More information on Zn fertilization of young trees may be found here. The rate, timing and mode of application depend on the zinc formulation used. Zinc sulfate (ZnSO4; 36% Zn) is the most widely used Zn fertilizer, and it is normally applied in fall [Zn15]. An application of 10-50 lbs/acre of zinc sulfate applied with 50-100 gallons of water in fall is effective in preventing deficiencies [Zn5]. Since fall zinc sulfate sprays cause the tree to defoliate faster, they should not be done too early (September) or too late (November) as this may reduce the amount of N transferred to the tree's permanent structures before leaf fall [Zn4, Zn9]. Mid-to late- October applications are common [Zn1, Zn4]. Recent studies by Scott Johnson indicated that lower rates of zinc sulfate (5 lbs/acre) can be safely applied in September or early October without an increase in leaf drop (Roger Duncan, personal communication). Zinc sulfate may be applied during dormancy but this is less effective than applying in fall [Zn9]. Fall sprays of zinc sulfate may be combined with a fall urea spray. Combining fall urea and Zn sprays may increase the amount of applied N and Zn remobilized out of the leaf into the tree's permanent structures before senescence compared with applying either nutrient alone [Zn1] (See Foliar N). Fall zinc sulfate sprays should not be combined with dormant oil sprays, or applied within several weeks of an oil spray [Zn15]. Zinc sulfate may be used all season; however, much lower rates should be used in spring and summer as it can damage both leaves and fruits [Zn9, Zn14]. In spring neutral or basic zinc or zinc EDTA are better choices as they are less toxic [Zn9, Zn15]. Amino acid chelated zinc products are commonly used, but have not been widely studied. A study with zinc polyamine, a product derived from zinc sulfate chelated with organic and amino acids, found that it was taken up as effectively as zinc sulfate, and had similar toxicity risks [Zn9, Zn14]. Basic (52% Zn) or neutral zinc is a good choice for spring and in-season applications [Zn9, Zn15]. It is less phytotoxic than zinc sulfate, but also less effective at correcting Zn deficiencies and more expensive [Zn9]. Sprays of neutral or basic zinc at 10-15 lbs/acre can be applied in spring or summer, and may be applied with oil-containing pesticide sprays [Zn9]. However, in-season basic zinc applications may leave spray deposits on the fruit. If applied with too much water or shortly before it rains Zn sprays may also cause leaf burn and defoliation [Zn15]. Zinc EDTA (9% Zn) is also a good choice for correcting mild deficiencies in spring [Zn15]. Adaskaveg, J.E., Schnabel, G., Forster, H., 2008. Diseases of peach caused by fungi and fungal-like organisms: biology, epidemiology and management. In: Layne, D.R., Bassi, D., (Ed.). The Peach: Botany, Production and Uses. CAB International, Oxfordshire, UK. pp. 352-406. Andris, H., Johnson, R.S., Day, K., 1995. Evaluation of alternatives to soil applied leachable nitrogen. California Tree Fruit Agreement Research Report. Cao, T., Duncan, R.A., Kirkpatrick, B., Shackel, K., DeJOng, T.M., 2013. Effect of calcium and nitrogen fertilization on bacterial canker susceptibility in stone fruits. Fruits 68, 245-254. Cao, T., McKencry, M.V., Duncan, R.A., DeJong, T.M., Kirkpatrick, B.C., Shackel, K.A., 2006. Influence of Ring Nematode Infestation and Calcium, Nitrogen and Indoleacetic Acid Application on Peach Susceptibility to Pseudomonas syringae pv. syringae. Phytopathology 96, 608-615. Daane, K.M., Johnson, R.S., Michilaides, T.J., Crisosto, C.H., Dlott, J.W., Ramirez, H.T ... Morgan, D.P., 1995. Excess nitrogen raises nectarine susceptibility to disease and insects. California Agriculture 49, 13-18. Day, K.R., 2004. Improving the quality of stone fruits-- grower considerations. Tulare County Orchard Notes, May/June 2004. Day, K.R., DeJong, T., Johnson, R.S., 2015. University of California Fruit Report. Regents of the University of California. Doll, D., 2011. Fertilizing young almond trees - a few tips. Duncan, R., 2004. Fall foliar urea for bacterial canker management. The Scoop on Fruits and Nuts in Stanislaus County, October 2004. Duncan, R., 2007. Fall foliar sprays for peaches and almonds. El-Jendoubi, H., Abadìa, J., Abadìa, A., 2013. Assessment of nutrient removal in bearing peach trees (Prunus persica L., Batsch) based on whole tree analysis. Plant and Soil 369, 421-437. Furuya, S., Umemiya, Y., 2002. The influence of chemical forms on foliar- applied nitrogen absorption for peach trees. Acta Horticulturae 594, 97-103. Hasey, J., 2003. Mid-summer Updates. Sutter-Yuba Counties Orchard Notes, July 2003. Holtz, B., 2010. Fertilizing one-year old trees - Be careful! Johnson, R.S., 2004. Peach Tree Nutrition. Sutter-Yuba Counties Orchard Notes, July/August 2004. Johnson, R.S., 2008. Nutrient and water requirements of peach trees. In: Layne, D.R., Bassi, D., (Ed.). The Peach: Botany, Production and Uses. CAB International, Oxfordshire, UK. pp. 303-331. Johnson, R.S., Andris, H., Day, K., Beede, R., 2006. Using dormant shoots to determine the nutritional status of peach trees. Acta Horticulturae 721, 285-290. Johnson, R.S., Olivos, A., Xiaoqiong, Q., Crisosto, C., Michilaides, 2013. Proper nectarine nutrition improves fruit quality. Better Crops 97, 12-13. Johnson, R.S., Phene, C.J., Handley, D., Cochran, B., Handley, S., Wiley, P., 1997. Influence of irrigation management on nitrogen use efficiency, nitrate movement and ground water quality in a peach orchard. FREP final report. Johnson, R.S., Rosecrance, R., Andris, H.A., Brown, P., Weinbaum, S., 1998. Using high rates of foliar urea to replace soil applied fertilizer in early maturing peaches . FREP final report. Johnson, R.S., Rosecrance, R., Weinbaum, S., Andris, H., Wang, J., 2001. Can we approach complete dependence on foliar-applied urea nitrogen in an early- maturing peach? Journal of the American Society for Horticultural Science 126, 364-370. Jordan, M.-O., Vercambre, G., Gomez, L., Pagès, L., 2014. The early spring N uptake of young peach trees (Prunus persica) is affected by past and current fertilizations and levels of C and N stores. Tree Physiology 34, 61-72. Krige, G.T., Stassen, P.J.C., 2008. Mineral nutrient distribution and requirement of pulse drip fertigated 'Donnarine' nectarine trees. Acta Horticulturae 772, 355-360. LaRue, J.H., 1989. Establishing the orchard. In: LaRue, J.H., Johnson, R.S. (Eds.). Peaches, Plums and Nectarines: Growing and Handling for the Fresh Market. University of California, Division of Agriculture and Natural Resources, Publication 3331. pp. 21-30. Muñoz, N., Guerri, J., Legaz, F., Primo-Julio, E., 1993. Season uptake of 15N-nitrate and distribution of absorbed nitrogen in peach trees. Plant and Soil, 150, 263-269. Natural Resource Conservation Service Crop Nutrient Tool. Accessed April 2015. Neilsen, G.H., Neilsen, D., Peryea, F., 1999. Response of soil and irrigated fruit trees to fertigation or broadcast application of nitrogen, phosphorus and potassium. HortTechnology 9, 393-401. Niederholzer, 2012. Summer leaf sampling is serious business. Niederholzer, 2013. Efficient nitrogen management in prune production . Sacramento Valley Regional Prune Newsletter, April 2013. Niederholzer, F.J.A., DeJong, T.M., Saenz, J.-L., Muraoka, T.T., Weinbaum, S.A., 2001. Effectiveness of fall versus spring soil fertilization of field-grown peach trees. Journal of the American Society for Horticultural Science 125, 644- 648. Norton, M., Duncan, R., Hasey, H., 2007. Growing processing cling peaches in California: an overview. University of California Division of Agriculture and Natural Resources, Publication 8276. Policarpo, M., De Marco, L., Caruso, T., Gioacchini, P., Tagliavini, M., 2002. Dynamics of nitrogen uptake and partitioning in early and late fruit ripening peach (Prunus persica) tree genotypes under a Mediterranean climate. Plant and Soil 239, 207-2014. Reil, W., Duncan, R., 2002. Tree planting tips for almonds and stonefruit. Rubio-Covarrubias, O.A., Brown, P.H., Weinbaum, S.A., Johnson, R.S., Cabrera, R.I., 2009. Evaluating foliar nitrogen compounds as indicators of nitrogen status in Prunus persica trees. Scientiae Horticulturae 120, 27-33. Rufat, J., DeJong, T.M., 2001. Estimating seasonal nitrogen dynamics in peach trees in response to nitrogen availability. Tree Physiology 21, 1133–1140. Saenz, J.-L., DeJong, T.M., Weinbaum, S.A., 1997. Nitrogen stimulated increases in peach yields are associated with extended fruit development period and increased fruit sink capacity. Journal of the American Society for Horticultural Science 122, 772-777. Tagliavini, M., Marangoni, B., 2002. Major nutritional issues in deciduous fruit orchards of Northern Italy. HortTechnology 12, 26-31. Ventura, M., Scandellari, F., Bonora, E., Tagliavini, M., 2010. Nutrient release during decomposition of leaf litter in a peach (Prunus persica L.) orchard. Nutrient Cycling in Agroecosystems 87, 115-125. California Plant Health Association, 2002. Western Fertilizer Handbook 9 th edition. Interstate Publishers, Inc.
Fulton, A., 2010. Understanding and applying information from a soil test: Part 2 - NPK. Glenn, D.M., Welker, W.V., 1993. Root development patterns in field grown peach trees. Journal of the American Society for Horticultural Science 118, 362- 365. Johnson, R.S., Crisosto, C.H., Andris, H.L., Beede, R.H., Day, K.R., Holtz, B.A., 2005. Refining stone fruit deficiency and sufficiency nutrient levels. Presented at the 2005 California Plant and Soil Conference, Modesto, CA. Johnson, R.S., Olivos, A., Xiaoqiong, Q., Crisosto, C., Michilaides, 2013. Proper nectarine nutrition improves fruit quality. Lilleland, O., Brown, J.G., 1939. The phosphate nutrition of fruit trees II. Continued response to phosphate applied at the time of planting. Proceedings of the American Society for Horticultural Science 37, 53-57. Lilleland, O., Brown, J.G., 1942. The phosphate nutrition of fruit trees IV: The phosphate content of peach leaves from 130 orchards in California and some factors which may influence it. Proceedings of the American Society for Horticultural Science 41, 1-10. Lilleland, O., Brown, J.G., Conrad, J.P., 1942. The phosphate nutrition of fruit trees III: Comparison of fruit tree and field crop responses on a phosphate deficient soil. Proceedings of the American Society for Horticultural Science 40, 1-7. Neilsen, G.H., Hogue, E.J., Yorston, J., 1990. Response of fruit trees to phosphorus fertilization. Acta Horticulturae 274, 347-359. Neilsen, D., Parchomchuk, P., Hogue, E.J., 1993. Soil and peach seedling responses to soluble phosphorus applied in single or multiple doses. Communications in Soil Science and Plant Analysis 24, 881-898. Peacock, W.L., 1989. The use of soil and water analysis. In: LaRue, J.H., Johnson, R.S. (Eds.). Peaches, Plums and Nectarines: Growing and Handling for the Fresh Market. University of California, Division of Agriculture and Natural Resources, Publication 3331. pp.62-67. Rombolà, A.D., Sorrenti, G., Marodin, G.A.B., De Pieri, A.Z., Barca, E., 2012. Nutrient and soil management in stone fruit trees in temperate regions. Semina-Ciencias Agrarias 33 639-654. Taylor, B.K., 1975. Response of newly planted peach and apple trees to superphosphate. Australian Journal of Agricultural Research 26, 521-528. Taylor, B.K., Issell, L.G., 1976. Comparative effects of foliar- and root- applied phosphorus on one-year-old peach trees. Australian Journal of Experimental Agriculture 16, 596-599. Boland, A. -M., Mitchell, P.D., Jerie, P.H., 1993. Effect of saline water combined with restricted irrigation on peach tree growth and water use. Australian Journal of Agricultural Research 44, 799-816. Duncan, R., 2005. Fall nutrition for almonds and stonefruit. The Scoop on Fruits and Nuts in Stanislaus County, October 2005. El-Jendoubi, H., H., Abadìa, J., Abadìa, A., 2013. Assessment of nutrient removal in bearing peach trees (Prunus persica L., Batsch) based on whole tree analysis. Plant and Soil 369, 421-437. Ghanem, M., Ben Mimoun, M., 2010. Effects of potassium foliar sprays on Royal Glory peach trees. Acta Horticulturae 868, 261-266. Hoffman, G.J., Catlin, P.B., Mead, R.M., Johnson, R.S., Francois, L.E., Goldhamer, D., 1989. Yield and foliar injury responses of mature plum trees to salinity. Irrigation Science 1989, 215-229. Lilleland, O., Uriu, K., Muraoka, T., Pearson, J., 1962. The relationship of potassium in the peach leaf to fruit growth and size at harvest. Proceedings of the American Society for Horticultural Science 81, 162-167. Reuveni, M., Reuveni, R., 2002. Mono-potassium phosphate fertilizer (PeaK)-- a component in integrated control of powdery mildews in fruit trees and grapevines. Acta Horticulturae 594, 619-625. Ruiz, 2006., Effects of different potassium fertilizer on yield, fruit quality and nutritional status of 'Fairlane' nectarine trees and on soil fertility. Acta Horticulturae 721, 185-190. Sotiropoulos, T., Therios,I., Nikolaos, V., 2010. Effect of various foliar sprays on some fruit quality attributes and leaf nutritional status of the peach cultivar 'Andross'. Journal of Plant Nutrition 33, 471-484. Stassen, P.J.C., Stadler, J.D., 1988. Seasonal uptake of phosphorus, potassium, calcium and magnesium by young peach trees. South African Journal of Plant and Soil 5, 19-23. Wooldridge, J., 2006. Effect of extending the early season potassium supply on young 'Keisie' canning peach trees on sandy, infertile soil. South African Journal of Plant and Soil 23, 212-214. Castagnoli, S.P., DeJong, T.M., Weinbaum, S.A., Johnson, R.S., 1990. Autumn foliage applications of ZnSO4 reduced leaf nitrogen remobilization in peach and nectarine. Journal of the American Society for Horticultural Science 115, 79-83. Duncan, 2007. Fall foliar sprays for peaches and almonds. Johnson, 2009. Cost effective zinc nutrition. Presented at the North San Joaquin Valley Cling Peach Day, Modesto CA, 2009. Johnson, R.S., 2012. Adding zinc to the planting hole of peach trees. Johnson, R.S., Saa, S., Brown, P.H., 2013. Testing the effectiveness of zinc formulations using peach seedlings. Acta Horticulturae 984, 125-130. Norton, M., Duncan, R., Hasey, H., 2007. Growing processing cling peaches in California: an overview. University of California Division of Agriculture and Natural Resources, Publication 8267. Swietlik, D., 2002. Zinc nutrition of fruit crops. HortTechnology 12, 45-50.